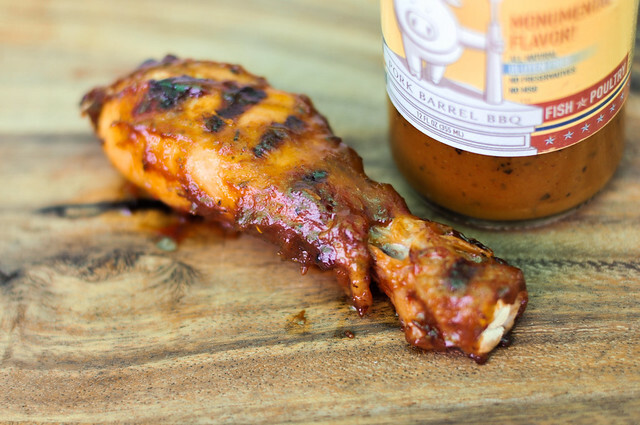 A sauce that delivers on its name, Pork Barrel Mustard BBQ Sauce doles out the pungent bite of mustard with an added tartness and spice, but without much sweetness. Going way back, I took advantage of a Pork Barrel super sale to get my hands on their three sauces and rub. 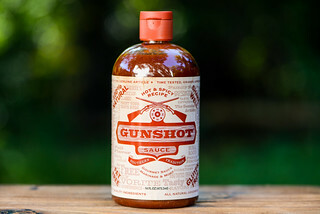 I quickly found the ex-senate staffer duo of Brett Thompson & Heath Hall put out a pretty mean sweet sauce, and a regular sauce that faired well too. In the time since then, I've had a chance to eat at their Alexandria, VA restaurant, and in just a few weeks I'll be competing against them—among 50 others—at Que by the Sea in Seaside Heights, NJ. Having Pork Barrel on the mind, I realized I never gave the third sauce in the lot a go and decided it was time. This sauce isn't messing around with the mustard. The pungent aroma of mustard is strong, going as far as burning the nose with its intensity. There's only a slight sweetness to keep it from all out dominating, hinting at a bit of honey underneath its base. Secondary notes come in the form of onion and vinegar, with a peppery kick underlaying the heat of the mustard. This yellow-orange opaque sauce is heavily studded with spices, giving it a textured look. It weighs in just on the heavier side of medium. When held from a suspended spoon, it globs off in chunks, leaving a pretty thick coating left clinging. 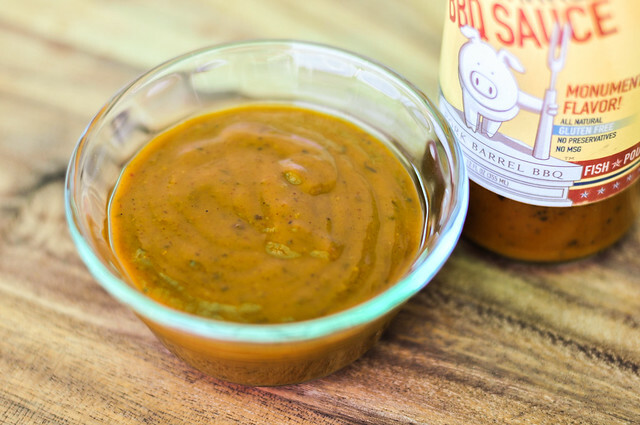 As with the aroma, this sauce is strongly mustard from start to finish in flavor. 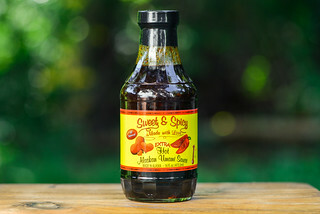 Its sharpness only lets a little sweet honey come through at the beginning, but that quickly fades as vinegar takes over, which only amps up the heavy flavor. Worcestershire sauce adds a complex undertone that comes out as the sauce settles on the tongue. Capping off the flavor profile, a wave of spicy pepper ends the progression and you're left with a tart, bitter, and spicy aftertaste. The sauce coated and baked in a bit globby over indirect heat, with some burn off and very little caramelization over direct heat. The sharp mustard and tartness still dominated, with only a slight increase in sweetness. The loads of spices added character and gave the chicken a kick, but it was still mainly mustard that could be tasted throughout eating the entire leg. 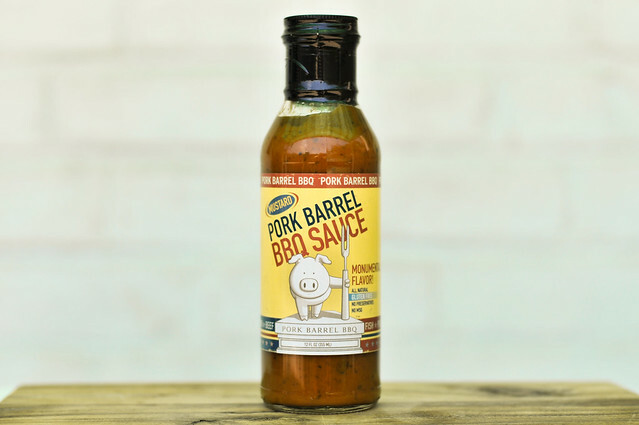 If mustard is your thing, you probably will enjoy Pork Barrel Mustard. The strong bite of mustard is mostly what you get with this sauce, with added tanginess thanks to vinegar, and a bit of heat from the spices. 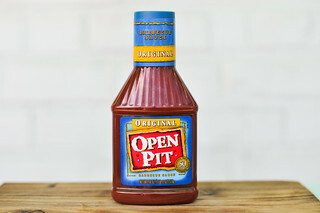 For me, it tasted too much like an overly tart mustard without enough sweetness for it to feel like a balanced barbecue sauce. An extra squirt of honey or hit of brown sugar would fix that for me, and it's easy to add if you're like me and are looking beyond a primarily strong mustard flavor. I wasn't digging how it worked with the chicken—it was a little too overpowering—but I bet it would fair really well with beef brisket or short ribs, which love some heat and bite more than sweetness. I'm a fan of mustard sauce for pork and do like it on chicken too, but for chicken it depends on the recipe.